Daniel Jacob Stern (born August 28, 1957) is an American film and television actor, comedian, director and screenwriter. 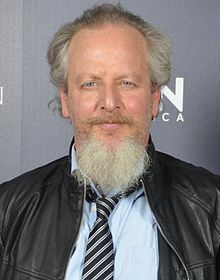 He is known for his role as Marvin "Marv" Merchants in Home Alone (1990) and Home Alone 2: Lost in New York (1992), Phil Berquist in City Slickers (1991) and City Slickers II: The Legend of Curly's Gold (1994), the voice of Adult Kevin Arnold on the television series The Wonder Years and the voice of "Dilbert" on the animated series of the same name. Stern was raised in Bethesda, Maryland, to a social worker father and a mother who managed a day care center. His family is Jewish. His brother is a television writer David M. Stern. During his years at Bethesda-Chevy Chase High School, Stern starred in several theater productions, including playing C.C. Baxter in Promises, Promises and Tevye in Fiddler on the Roof. Stern applied for a job as a lighting engineer for a Shakespeare Festival in Washington, D.C., but was hired as a walk-on in their production of The Taming of the Shrew, starring Glenn Close. He dropped out of high school in his senior year and soon moved to New York. After taking acting lessons at HB Studios with Austin Pendleton and Herbert Berghof, Stern began his acting career in Off Broadway and Broadway productions, including True West with Gary Sinise and How I Got That Story at Second Stage Theatre with Bob Gunton. He acted in numerous productions at The Public Theater, Ensemble Studio Theater, Cherry Lane Theater, and Manhattan Theater Club. In 1979, Stern made his film debut as Cyril in Breaking Away. The following year he played a student who raised objections during Jill Clayburgh's proof of the snake lemma in the film It's My Turn. His breakthrough role as Laurence "Shrevie" Schreiber came in Barry Levinson's Diner. He had another early film role in the 1984 horror film C.H.U.D., as the soup kitchen C.H.U.D. hunter. He appeared in two films with Woody Allen, Stardust Memories and Hannah and Her Sisters. Stern has played characters in a number of comedic roles, such as Phil Berquist in City Slickers and City Slickers II: The Legend of Curly's Gold, and Marvin "Marv" Murchins the burglar in the first two Home Alone films, Home Alone and Home Alone 2: Lost in New York, with Joe Pesci. However, he declined to play the character once again in the fourth installment of the franchise, believing the script to be an insult to the original motion picture. He also starred as Max in Bushwhacked. He provided the voice of the narrator on the TV series The Wonder Years, which starred Fred Savage as Kevin Arnold. As narrator, Stern played the adult Kevin Arnold, remembering his youth. Stern and Savage were also featured together in Little Monsters, in which Stern played the father of Savage's character. In the late 1990s, Stern took on a more serious role in the black comedy Very Bad Things with Christian Slater, Cameron Diaz and Jon Favreau. Stern provided the voice for the main character of the Dilbert animated TV series, based on the comic strip by Scott Adams. Stern directed several episodes of The Wonder Years and the 1993 feature film Rookie of the Year, and in recent years directed two episodes of the TV series, Manhattan. Stern created, wrote and starred in the CBS television show Danny. He wrote the off-Broadway hit "Barbra's Wedding", which was produced by The Dodgers and Manhattan Theater Club. It starred John Pankow and Julie White and ran for six months. Mr. Stern also appeared in the play at Garry Marshall's Falcon Theater. Stern was originally offered the role of Dale Gribble in King of the Hill but he was replaced by Johnny Hardwick when his salary agreement went low. Stern works as an artist, specializing in bronze sculpture. He has created sculptures for public art projects in San Diego, Pasadena, Palm Desert, Temple City and Agoura Hills. He is an artist in residence at Studio Channel Islands Art Centre in Camarillo. He has also done many private commissions, gallery exhibitions and art fairs. He is the father of California State Senator Henry Stern and daughters Ella and Sophie Stern. 1986 Comedy Factory Leon Episode: "Man About Town"
1991 The Simpsons Narrator Episode: "Three Men and a Comic Book"
1997 Gun Harvey Hochfelder Episode: "The Shot"
1998 Hey Arnold! Mr. Packenham (voice) Episode: "Tour de Pond/Teachers' Strike"
2009 Family Guy Narrator (voice) Episode: "FOX-y Lady"
2009 Monk Sheriff Franklin Episode: "Mr. Monk and the UFO"
2013 Workaholics Travis Rockne Episode: "Alice Quits"
2017 Love Marty Dobbs Episode: "Marty Dobbs"
^ "New Face: Daniel Stern Off the Sofa and Onto the Movie Screen in 'Breaking Away'; 'But It Was Cheap Rent'". The New York Times. August 31, 1979. Retrieved April 30, 2010. ^ Day, Heather Thompson (2013). How to Feed the Mediavore: The 30 Day Challenge. Review and Herald. p. 28. ISBN 9780812756555. 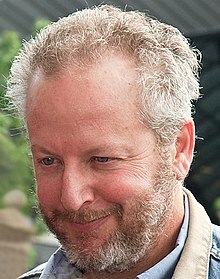 Wikimedia Commons has media related to Daniel Stern. This page was last edited on 8 February 2019, at 01:20 (UTC).